High efficiency design allows the CS1 to reveal the classic Polk Audio sound (open, spacious and clear) even when driven by modestly-powered amplifiers and receivers. 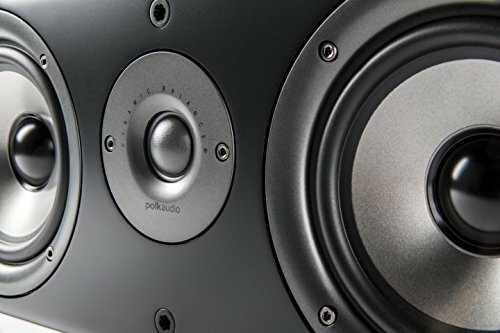 1" (25mm) Fabric/Polymer Composite Dynamic Balance Dome Tweeter with powerful Neodymium magnet structure delivers clear and detailed high frequency response for realistic reproduction of vocals and instruments. Bi-Laminate Composite Dynamic Balance Drivers are lightweight and stiff with good damping for high efficiency, excellent bass and lower distortion. Non-resonant all-MDF enclosure construction with 3/4-inch-thick baffles ensures cleaner, clearer, more lifelike sound quality. Reversible-design cabinets can be turned upside down to aim "up" when placed under a video monitor.